Have a question about AccuWeight, can't find an anwser? May I use creamer in my coffee? Regular whole milk may be used in your coffee between 12pm and 6pm on your milk days. Non-dairy creamers are not allowed because they are not zero calorie and they all contain sugars and/or corn syrup solids which do not comply with the chemistry of the program. What can I do about hunger after 6 p.m.? The body cannot tell the difference between thirst and hunger. If you experience hunger after 6 p.m. try drinking more water. Can I have sugar-free Jell-O after 6 p.m.? You may have sugar-free gelatin any time (as long as you make it yourself). Please note, however, that sugar-free Jell-O pudding is not allowed at any time. You may also make ice pops from Crystal Light and/or any flavored drink that’s allowed 24/7 and enjoy that in the evening. May I have sugar-free gum and candy? You may have up to 6 pieces of sugar-free gum and/or sugar-free candy any time of any day. For candies, no more than 10 calories each per piece. My friends want to go out to dinner tomorrow. May I use “Special Day” protocol? No. Special Day protocol is only for very special occasions such as your daughter’s wedding, grandmother’s 90th birthday, grandchild’s christening, etc. Special Day protocol is still time off the diet – it is a guided way to go off plan, but is not part of the program itself. Use of Special Day protocol will slow down the weight loss for the week. If I make soup, do I weigh the vegetables before or after cooking? The 1½ lbs vegetable allowance is raw weight. As a reminder, you are not required to eat the entire vegetable allowance – eat until you are satisfied. May I use chicken or beef broth when making soup? No. However you may use vegetable stock or vegetable broth. Up to 8 oz may be used “free” (i.e., not counted as part of your 1½ lbs of vegetables). Over 8 oz, 2 oz of stock = 1 oz of vegetables. For your convenience, there is a vegetable stock recipe on the web site. May we use bouillon cubes? You may use vegetable bouillon to flavor soup or to sauté vegetables but you should not drink it. Bouillon cubes are problematic due to their high salt content. We prefer you use vegetable broth or vegetable stock. No. It is not healthy to have 3 days of either protocol in a row, as it is breaking up the nutritional balance of the program. Get right back on track by continuing with your normal cycle of food as if nothing happened. When you are feeling stronger about the situation, look back and learn a lesson about why you cheated – this way, the cheat wasn’t wasted time. I’m feeling very light headed. Is this normal? Approximately 10% of our clients experience some light-headedness during the first ten days to two weeks of the program while the body is going through detoxification. The program is cleansing your body of refined sugars resulting in the normalization of blood sugar levels. This is very healthy, but if it happens quickly it may cause light-headedness. A spoonful of honey in a cup of hot tea and you’ll have relief in 5-7 minutes. If you have high or low blood pressure and are experiencing light headedness or dizziness, please speak to your consultant about the proper protocol to address your medical situation. May we use any condiments? No. Most condiments contain vinegar, which will neutralize the chemistry of the program. All spices and seasonings are allowed. May we use Dijon Mustard? Dijon mustard may be used in very small amounts as part of a recipe. For example, you may use a small amount of mustard as part of a salad dressing recipe to be used over many salads. A ¼teaspoon in a recipe used over many salads is the maximum. If the beads are only good for 9 days and I cannot get to the office to change them, what should I do? Acupressure points go dull after 9 days. If you are unable to make it to one of our office locations but do not want a gap in your program, you may temporarily join the Long Distance Participation program. Contact the office with your current weight and either an email address or fax number. We will furnish you with a bead placement diagram and instructions for placement. You may move your current beads to the new location and secure with new bandaids. Please note, you will incur the normal office visit charge for this service. May I swim and take showers without losing beads? Yes. On occasion, the bandaids used to secure the beads will fall off. You may replace these with any bandaid cut to size. It is rare to lose the beads themselves. May we have V-8 juice? We prefer you do not have any type of juice on a fruit and vegetable day. It takes ½ lb - 1 lb of vegetables to make one 8-oz glass of V8 juice. As you are not having solid foods on milk days, we prefer your body has the opportunity to chew solid food on vegetable days. V-8 is allowed as an ingredient in making salad dressings as long as the dressing is spread out over several salads. May we have Fage (Greek) yogurt? You may not use Greek yogurts such as Fage as they contain cream, not just whole milk. When in doubt, check the ingredient list--if you see the word “cream,” the answer is no. Please note, some whole milk yogurts such as Stoneyfield Farms market themselves as having "cream on the top." Again, check the ingredient list--often these do not have cream in them at all, it’s just a marketing tool. May we use Butter Buds, PAM or I Can’t Believe It’s Not Butter Spray (ICBINB)? With the exception of the first two weeks of the program when your body is going through detoxification, you may use the zero-calorie cooking sprays SPARINGLY. We prefer you avoid ICBINB spray as it contains soy, but it is allowed. I am craving salty foods, what should I do? When you crave salt and salty foods, it’s typically a sign that your body is dehydrated. Drink more water to alleviate the dehydration. To satisfy the salt craving, have some salt -- lick your finger, dip in salt, lick the salty finger. Then drink some more water. While we cannot always vouch for how you will feel during initial detox (first 10 days to 2 weeks), exercise is allowed. However, if your body is telling you to slow down during this time, you should listen to your body. The only prohibited exercise is body building (very high weights with low repetition). Body toning (lower weights with high numbers of repetition) is absolutely allowed. All other exercise is allowed. Please see our Exercise Protocol here. May I have dried/dehydrated fruits? No. With dehydrated fruit it is difficult to determine how much comprises a single serving (i.e., one cup of raw fruit). It is permitted if you are dehydrating the fruit yourself and, therefore, can control the serving size. May we use Crystal Light? Yes. You may have up to 2 “On The Go” packages per day (any time of day). The calorie content in Crystal Light indicates traces of sugar, which is why we limit its use. What can I do if I feel cold all the time? Cayenne capsules or Capsaicin capsules (which contain cayenne) will help warm you up from the inside out. Maximum is 100,000 H.U. (heat units) per day. May we have Cool Whip? No. Cool Whip is not allowed as it contains corn syrup and high-fructose corn syrup. May we have hot chocolate? Pre-packaged hot chocolate is NOT allowed (unless you find a 0-calorie brand we are unaware of). You may make hot chocolate using Walden Farms or other 0-calorie sugar-free syrup. On a milk day between 12 pm and 6 pm you may use milk to make the hot chocolate. At other times you may make hot chocolate using the syrup with water. May I have Cocoa or unsweetened baking cocoa? You should use 0-calorie, sugar-free chocolate syrup rather than cocoa. You can use unsweetened baking cocoa but you are limited to 2 tablespoons per day MAX. If used outside of 12pm to 6 pm, 1 tablespoon replaces 1 piece of sugar-free gum/candy. No, soy is NOT allowed. Instead of soy sauce, you may use BRAGG Liquid Amino, which can be found in most health food stores (Whole Foods carries it). Bragg Liquid Amino has no calories and tastes quite similar to soy sauce. My beads do not feel "even." Is that a problem? No. An acupressure point is almost the size of a dime and the beads are quite small. That's why were are able to offer the program long-distance--placing the bead precisely in the center is not required. The head is not exactly symmetrical and as we can feel the points, we put them in the "epicenter" of the point. This will often feel more skewed than when you look at them visually. What is the significance of eating between the hours of noon and 6 p.m.? The body is searching for nutrition between 12pm and 6pm. The combination of the nutritional balance of the food protocol and the use of the acupressure allows us to trick the body to ignore the reduction of calories. Therefore, the body does not "need" to defend itself and does not go into starvation mode. You still require energy to function. The body turns to its own stored fat for that energy and you reap the amazing results. Please note, this is not a ketotic diet. If you eat outside of the designated hours, the body will begin to recognize the caloric intake rather than nutritional value and the body will begin to go into starvation mode as the caloric intake is so low. The body will instead begin to cannibalize itself using not only fat, but muscle, organ mass and negatively affect your metabolism. Can we use Sweet-N-Low brown sugar or Splenda brown sugar? Sweet-N-Low brown sugar is permitted but not unlimited. Once a week for a recipe is fine. Splenda brown sugar cannot be used because it contains actual brown sugar. We list them in recipes as a fruit and they should be considered a fruit. 1. Start the day at 12pm (noon) with a Granny Smith (green) apple or ½ a grapefruit. If your special meal is earlier in the day, have the apple at 6pm. 2. Only diet liquids for the rest of the day except for the special meal. 4. A total of 5 – 7 oz. of fish, chicken, turkey, ham and/or eggs. 5. Vegetables made without oil (no starches). 6. If you decide to indulge in some of the trimmings, please be sensible and stay under control. 7. One (1) glass of wine or clean alcohol (e.g., vodka tonic, rum and diet coke, NO JUICE). 8. For dessert, fresh fruit. If you have been on the program for several weeks, you will find your sense of satisfaction comes quickly. Listen to your body and stop eating. Paying attention will stop you from overeating. Your old habit is still there, but not if you say NO. The next two days become milk / yogurt days. The following two days become fruit / veggie days, etc. Following this protocol will let you participate in the day and not create but only a slight slowing of weight loss. Hours are extended 12 noon – 8pm. All days are fruit and veggie days. In addition to the fruits and veggies, each day you may have up to a total of 5 – 7 ounces of protein, preferably fish, chicken and/or turkey. Fill up first on the veggies and protein. After that, if you would like to taste other things do just that – taste and be sensible (i.e., not a whole plateful). One glass of wine or clean alcohol per day (e.g., shot of Slivovitz). After the holiday, your first two days are milk / yogurt days, then two fruit / veggie days, etc. DO NOT WEIGH YOURSELF UNTIL AFTER THE TWO MILK DAYS! Our goal during the holiday is for you not to gain weight; we are not concerned with weight loss during this time. 2. Only diet liquids for the rest of the day until the Seder. 3. Food and drink directly related to the Seder should be eaten in moderation and as ritually required. 5. A total of 5 – 7 oz. of fish, chicken and/or turkey. 6. Vegetables made without oil (no starches). 7. If you decide to indulge in some of the trimmings, please be sensible and stay under control. The next two days after the two Seder days become milk / yogurt days. If you are not following the regular program for the remainder of the holiday, please see the Passover Protocol for non-Seder days. Hours are extended 12 noon – 8pm. If you are eating past 8pm, make sure that you finish eating at least 2 hours before you go to bed. A total of two servings of fruit (i.e., two cups). We recommend you have a Granny Smith (green) apple around 12 noon as one of your fruits. 1 ½ lbs of vegetables and up to a total of 5 – 7 ounces of protein preferably turkey, chicken or fish (please note that heavier proteins such as beef might give you an upset stomach). One glass of wine or clean alcohol (e.g., vodka tonic, scotch and diet soda, no juice). You will find your sense of satisfaction comes quickly.Listen to your body and stop eating when you feel satisfied. Paying attention will stop you from overeating – your old habits are still there but not if you say NO. Our goal during the holiday is to maintain your weight; we are not concerned with weight loss during this time. Please contact your AccuWeight Consultant or info@accuweight.com to discuss strategies and protocols for extensive business travel. Exercise is encouraged but not required. Please note exercise will not accelerate your weight loss, but is excellent for toning and promoting muscle and bone health. *** During the first 2 weeks of the program, you may fatigue more quickly than usual. Listen to your body and end the exercise for that day. Continue your regular regimen on the following day and continue to pay attention to your body’s fatigue level. You will notice the fatigue disappearing as the pancreas and liver adjust to each other on the program. You should feel as good as ever while exercising on program. If you are not feeling right during exercise, please contact your consultant for further guidance. AND DOES NOT PROVIDE MEDICAL TREATMENT. PLEASE SEE YOUR OWN PHYSICIAN FOR MEDICAL ADVICE. You should drink lots of fluids to keep properly hydrated. Unless instructed by your physician, continue to avoid juice. If you do not want to take a break from the program, please speak to your consultant about trying one of the non-dairy alternative milk protocols. Please note, when ill or on antibiotics the body will have a tendency to retain water. This is temporary and will pass. The protocol for illness will temporarily slow the weight loss, but if you follow the guidelines you will not gain. Lactose Intolerance is a deficiency of the lactase enzyme needed to digest lactose (milk sugar). Those with Lactose Intolerance may be able to digest small amounts of dairy products without assistance, but the symptoms will begin to reveal themselves with higher levels of dairy, such as the levels required while on the Accu Weight‐Loss Program. 1. Use lactase enzyme supplements on milk days. The most widely available brand is Lactaid (www.lactaid.com). Lactase enzymes are sold over the counter and are typically located near the antacids. Follow the instructions on the packaging. Should some symptoms continue to appear, you should consider increasing the dosage (for most brands, the standard dosage is to assist digestion of approximately 8 oz of dairy). 2. Switch to lactose free milk. The most widely available brand is Lactaid (www.lactaid.com). Note WHOLE milk is in the RED container. 3. You may use a combination of the above, i.e., use lactose free milk at home and use lactase enzyme supplements with yogurt and/or when you use regular milk outside of the home. Please notify your consultant if you continue to experience symptoms of Lactose Intolerance so we may assist in addressing the situation. Many medications cause water retention. This will slow the scale, but not the fat loss. It may take 7 - 10 days after you finish the course of your medication for the water retention to pass. Focus on the change in your body and the inches lost and you will continue to see your success. does your medication specifically indicate no dairy? does your medication specifically indicate no potassium? As long as you do not eat more than the recommended amounts, your body will only recognize the food you've eaten as a buffer and it will not compromise the program or slow your weight loss. Eating excess amounts will confuse the chemistry of the program and will slow your weight loss. Please contact your AccuWeight Consultant or info@accuweight.com for details about what to do for a special occasion. Please contact your Accuweight Consultant or info@accuweight.com when planning for your vacation. Connect with current clients and graduates of the program across the United States and around the world, as well as Accu Weight-Loss Consultants and Team members in this safe, secure Facebook environment. 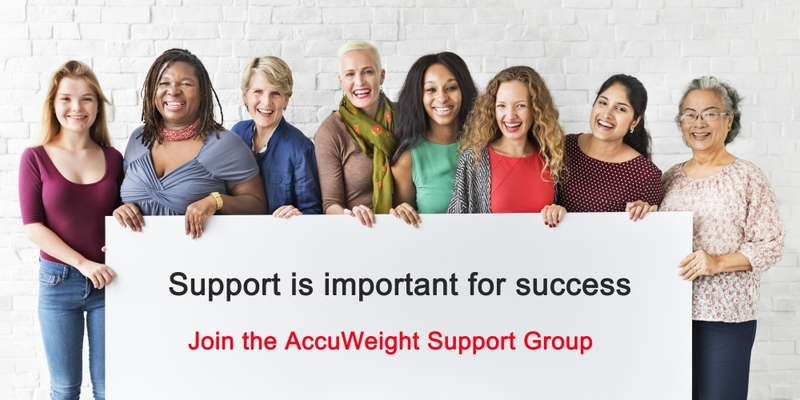 Members of the Accu Weight-Loss Facebook Secret Group share experiences, successes and challenges, provide support for each other and have Q&A with Accu Weight-Loss Team members. Members are also able to post photos of their weight loss progress and recipes they have made as part of their program. - Must be active on the Accu Weight-Loss Program within the past 60 days to be eligible for enrollment in the support group. It will take approximately 2 business days to confirm eligibility and process membership in the support group. Accu Weight-Loss reserves the right to decline membership and/or remove individuals from the support group at its sole discretion. We request that clients not use our company name as part of their email address.